I should start by saying, first, I am not an organized writer. And that's part of the reason I'm writing this post. 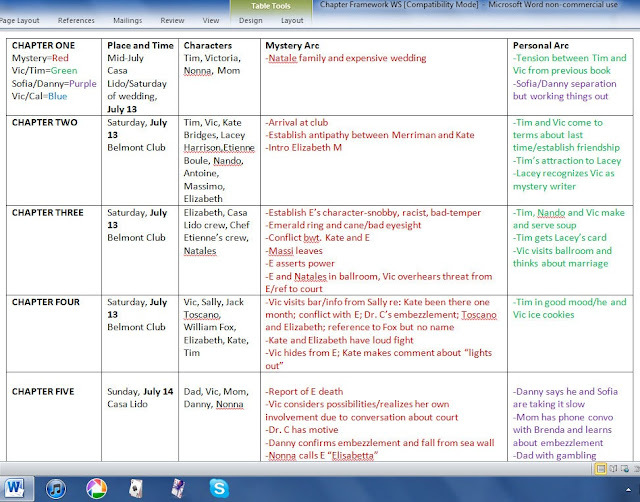 Until I started writing mysteries, I was a proud pantser who sorta/kinda organized plot events as she went along. But no more. The table function in Word helps me track my main plot and subplots. While working with Word can be less than rewarding for a writer, I do like the nifty table function. It's easy to use and manipulate. I set up a fairly simple chart for myself; the one pictured here is the one I'm using for my WIP, The Wedding Soup Murder. It uses a chapter breakdown in which I indicate place, time, date, and characters. I use red text for the main mystery plot, and other colors for the subplots. As I draft each chapter, I go back and fill in the chart. The chart, or my story compass, helps me stay on course in a number of ways. 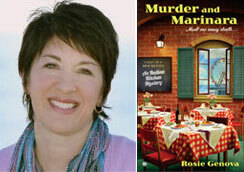 For example, cozy mysteries move at a fairly quick pace. If I look back over my chart and see that the green, purple, and blue text is taking up more space than the red, I go back to the ms and ensure that the subplots aren't bogging down the main story. I can read straight down the red text and isolate the main plot from the subplots, to make sure the mystery arc is swift, tight, and logical without the distraction of my main character's love life. On the other side of things, I can choose a color and follow that subplot, but I can also see how it is threaded into the main story, chapter by chapter. The chart also helps me identify a missing element. My main character has two love interests; I indicate one in green text and the other in blue. When I looked over my chart I realized that the blue ink didn't show up until Chapter Six. Her second guy had gotten short shrift in the story, so now I am working on ways to introduce him sooner. One last reason to love the chart: it makes a nice break from composing. Filling in another chapter is rewarding, and provides evidence of my progress. Whether we use sticky notes or fancy software, we all need to find our own way through our stories. What about you? What serves as your map? Your compass? Long before I started writing my novel, I created an outline of chapters, with a synopsis of each chapter. That was the first version of this spreadsheet. As I wrote the novel, I modified the spreadsheet to match the actual novel. Occasionally, I added fields for issues I wanted to make sure not to forget. Those fields became my checklist for each chapter. So for the second draft of the novel, I read each chapter and compared it to my checklist. The checklist includes columns for "What makes the chapter?" "What are the chapter's purposes?" "Is it poignant?" "Is it a page turner?" "Are the characters strong?" "Are they consistent with the rest of the book?" There are quite a few other columns. See my blog for the complete list. I also have a long list of thoughts on what a book needs. That is the second "methodology" entry on my blog, shown above. In any event, I appreciate seeing your chapter framework. I'm happy to have clicked on this terrific post, Rosie. I'm getting ready to begin outlining my first MG novel and don't have the slightest idea as to how to go about it. Your ideas might help, thank you. This is very helpful. I'm going to begin editing my first draft in a couple of weeks and I like your approach very much. I will def have to try the TABLE function in Word!Thank you for sharing!! Thank you again for sharing this!!! Years ago I'd draw my own text boxes and was looking for an easy way to add boxes and nobody was bale to help. Finally!!!! It's taken me a while to learn my way around Word, but I find tables pretty user-friendly. Good luck with your writing! Now I need one to help me get characters in and out of rooms! I'm a pantser, so I don't use a map before I start writing. However, after I finish a scene, I do record information in a story bible. It's in Evernote. I list the setting(s), which may include the weather, moon phase, or high tide; the names of the characters in the scene along with any related information (i.e., what they're wearing); characters mentioned and any related information; and then four bullets I always answer -- Connection to last scene, escalation, setback, and unexpected. There might also be a few miscellaneous notes.